In May 1980, His Holiness the 16th Karmapa began his last world tour, traveling through Greece, England, the United States, and Southeast Asia. During this tour, H.H. gave teachings, Vajra Crown ceremonies, empowerments, interviews, audiences, and engaged in many beneficent activities. On November 5, 1981, H.H. the Sixteenth Karmapa passed away into parinirvana at the American International Clinic in Zion, near Chicago, Illinois, USA. His Holiness’ kudung (body) was flown back to India. Karmapa’s cremation ceremony took place in Rumtek monastery on December 20, 1981. Indian dignitaries and several thousand of his disciples from all over the world attended the services. After the passing of the sixteenth Karmapa, it became the responsibility of his disciples to carry out His Holiness’ wishes, to continue his activities and to find and enthrone the 17th Karmapa. At this time, there was particular concern to care for the transition from the 16th to 17th Karmapa because of the prediction of the 5th Karmapa, Deshin Shekpa (1384-1415), who had foreseen troubles for the Karmapa lineage might arise at the seat “After the Sixteenth in the rosary of Karmapa [and] before the Seventeenth.” In addition, the administration was functioning from an exile seat far from its traditional seat at Tsurphu, Tibet. 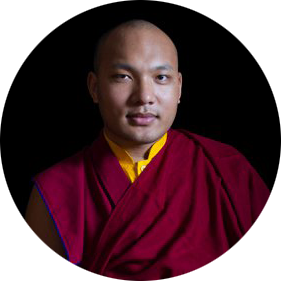 During the lifetime of the 16th Karmapa, he was served by General Secretary Dhamchoe Yongdu and his disciples, who made up the Karmapa’s labrang. Dhamchoe Yongdu was the General Secretary for the Karmapa for some 34 years, and his service spanned the Karmapa’s residence in both Tibet and India. A “labrang” is Tibetan institution common to most lines of tulkus — reincarnate lamas. The labrang functions as an administrative body with responsibility for supporting the Karmapa in worldly and spiritual affairs, and continues from generation to generation, as would a corporate institution in Western cultures. There have been Seventeen Karmapas up to now. During the lifetime of each Karmapa, the Karmapa was served by the labrang, usually headed by a General Secretary appointed by the Karmapa. After the passing of the 16th Karmapa, it was the responsibility of General Secretary Dhamchoe Yongdu and the labrang to carry on the good works and institutions established during the lifetime of the 16th Karmapa. Over the centuries, the labrang has traditionally functioned in this way, insuring the smooth transition from one Karmapa tulku to the next. In addition to the labrang, the duties of passing on the spiritual lineage of the Karmapas from one tulku to the next is accomplished by one of the Karmapa’s key disciples. The First Karmapa, Düsum Khyenpa, started the tradition of providing instructions to a disciple to find the next Karmapa tulku. Düsum Khyenpa left behind a letter with Drogon Rechen providing details of the circumstances of the rebirth of his reincarnation. In addition, the teachings of the Karmapa have over the centuries been passed along from “ear to mouth” through a lineage of transmission from person to person. The line of persons who have taken primary responsibility for passing the Karmapa lineage on from one to the next are, along with the Karmapas themselves, called the Golden Rosary of the Kagyu Lineage. Karma Pakshi, the Second Karmapa, received the transmission from Pomdrakpa, who had in turned received it from Drogon Rechen, who had in turn received it from the First Karmapa. And in this way the lineage of the Karmapas has been passed down to all the successive Karmapas through the centuries. To pass on the lineage, one must first properly identify the new reincarnation of the Karmapa. Uniquely among all the reincarnation lines in Tibet, the Karmapa provides instructions to a key disciple on how to locate the reincarnation. In almost all cases this instruction is passed, as done by the First Karmapa, in the form of a letter with details of the circumstances of the birth. This prediction letter is the key to the identification of the next Karmapa. In this way, the Karmapa is said to “recognize himself” through the activities of his previous incarnation. Thus the heirs of the Karmapa must also exert themselves to find the reincarnation according to the predictions of the previous Karmapa, and, once found, to properly enthrone him under auspicious circumstances. Since the First Karmapa’s passing in 1193, many notable masters over the centuries have passed the lineage on to the succeeding Karmapa. Since the end of the 18th century, the members of the Golden Rosary of the Kagyu Lineage included either one of the Tai Situpa emanations or one of the Jamgon Kongtrul emanations. Prior to that time the Golden Rosary had included the Shamar Rinpoche incarnations and the Goshir Gyaltsab emanations, as well as many other great yogis. The day after the cremation ceremony, a general Karma Kagyu meeting was held in Rumtek at the request of Mr. Dhamchoe Yongdu, the General Secretary to the 16th Karmapa and head of his labrang. He requested the four heart-sons of His Holiness—the current Shamar Rinpoche, Tai Situ Rinpoche, Jamgon Kongtrul Rinpoche, and Goshir Gyaltsab Rinpoche—to form a council of regents to take joint responsibility for the spiritual affairs of the Karma Kagyu lineage. He also asked them to locate Karmapa’s instructions concerning his next rebirth and thus bring forward his next incarnation. The four Rinpoches accepted the task and expressed their sincere desire to fulfill the wishes of the Sixteenth Karmapa. The four were officially referred to as the “four seat-holders.” The four were to alternate as the regent of His Holiness, serving for three years in rotation, each taking lead responsibility for preserving the activity of the Karmapa during that three year period of their term. At the end of each three year term, one seat-holder was to step down and the next was to serve as regent. The Nectar of Dharma, the official publication of the Office of His Holiness International Headquarters in Rumtek, announced this arrangement, to which all the seat-holders agreed. Though the labrang and administration of each seat-holder is traditionally separate from the labrang of His Holiness, the labrang of the Karmapa also supported the seat-holder in their roles of searching for His Holiness and carrying out the Karmapa’s spiritual duties during the transitional period. After the council of regents was established, His Holiness’s General Secretary undertook the central task of preserving the sacred remains of the Sixteenth Karmapa. He supervised the construction of the new “Thong-Drol Lha-Khang,” a “Lha-Bab Chorten” and gold “Jangchub Chorten,” to hold these precious relics of His Holiness the 16th Gyalwang Karmapa. On December 11, 1982, after 34 years of service as General Secretary to His Holiness, Mr. Dhamchoe Yongdu unexpectedly passed away, shortly after the inauguration of these precious items in the temple at Rumtek. After the unexpected death of the Mr. Dhamchoe Yongdu, Topga Yulgyal took over as General Secretary during the three-year term of Shamar Rinpoche as rotating temporary regent. Tenzin Namgyal continued his role as Deputy General Secretary. After Shamar Rinpoche failed to relinquish his position pursuant to the 1981 agreement, Topga Yulgyal continued to hold the post of General Secretary until 1992, when his resignation as General Secretary was required by resolution of the Kagyu International Assembly at a meeting held at Dharma Chakra Centre from 30 November, 1992 to 3 December, 1992. Mr. Tenzin Namgyal succeeded to the position of General Secretary. During the time between the 16th and 17th Karmapa, many disciples loyal to the Karmapa accomplished the wishes of the 16th Karmapa and saw that his activities were carried out. The three wishes of the Karmapa — establishment of Nalanda Institute as a top-flight monastic university, the printing of 500 copies of the 215 volume Tengyur, and the construction of Karme Dharma Chakra Central in New Delhi — were completed. Nalanda Institute graduated its first class in 1990; the volumes of the Tengyur were distributed at no or low cost to monasteries throughout the world; and the construction of the Centre in New Delhi was completed. During this time, foremost in the minds of all disciples of His Holiness was the discovery of the tulku of His Holiness, to be enthroned as the 17th Karmapa. Finally, the instructions of His Holiness the 16th Karmapa were discovered and on March 19, 1992, an official search party was dispatched from Tsurphu Monastery to locate the reincarnation and request the Karmapa to take his place on the throne of the Karmapas at his traditional main seat. His Holiness the 17th Karmapa was finally discovered, in eastern Tibet, in May of 1992.